The Glove Grabba Max, new improved design with breakaway safety feature.Glove Grabba Max reduces hand injuries and reduces lost glove costs. Implementing the use of the original Glove Grabba or the new Glove Grabba Max can not only reduce glove replacement costs but more importantly reduce hand injuries. Using a Glove Grabba ensure workers always have their gloves with them when they need them most. 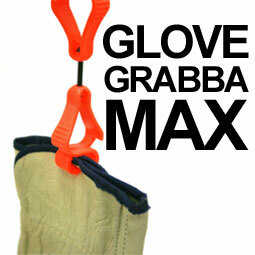 Glove Grabba Max - so easy to use. Just clip one end to your belt loop, belt, pocket or just about anywhere on your clothing or bag. The other end clips easily to your gloves, large or small. Glove Grabba Max improved safety feature. The new Glove Grabba Max design incorporates a breakaway safety cord that helps prevent workers from being unbalanced if gloves are caught in machinery or while working at heights with ladders and scaffolding. The Glove Grabba Max weighs only 22.5 grams and measures 11.5 cm long and is moulded from non-corrosive and non-conductive material that has been engineered to hold it memory and resist flex fatigue. The Glove Grabba Max also features Interlocking teeth that will hold onto any pair of safety gloves or clothing .